There are a few variations. Clams used are typically quahogs, but Atlantic surf clams can be used as well. The batter can also be pan fried in usually butter, creating a clam pancake but I greatly prefer these deep fried as do most people I’ve asked. The term clam fritters is sometimes used but always ask what this means before ordering as it can have different interpretations! When frying them in oil, the traditional preparation, in Maine the batter is formed into hamburger shaped patties. You do not want them too thick so they will cook easily and evenly throughout. Once they float flip them over so both sides brown and once they have they are ready to eat! I like them as is but many people add tartar sauce or ketchup as well. In Rhode Island and nearby, they are more likely to have a blob or fritter shape than a hamburger shape. My favorite clam cakes come from Kens Seafood on Pine Point Road in Scarborough Maine, right up the street from my house. See the picture to the left. My old friend Jake (a nickname) ran it for years and many friends worked there. Nancy S would often work until close and would bring any leftover clam cakes back for us to eat. We always joked about calling in fake orders near closing time so that there would be many extras, but I don’t think we ever did that! Some people think of Clam Cakes as a poor man’s dish, as the clams are certainly extended by the batter. I do prefer fried clams in general, although they are more expensive and much more caloric, but I would never give up the occasional clam cake! Sometimes clam cakes are more suitable. 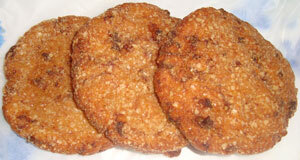 I wouldn't want a late night fried clam snack a they are too dense and caloric, but a late night clam cake snack rocks! Beware of “Clam’s Cakes” in England. They are made by a place called “Clams” and are an ordinary cake – no clam in them at all. Reputedly pretty good, I would rather have a real clam cake as I’m not a dessert guy. Clam cakes can be sold as “stand up” appetizers, for example from stands near the Block Island , Ferry in Rhode Island, or as sit down meals complete with fries and coleslaw as in my favorite places in Maine. They can also be put on a bun much like a hamburger and dressed up however you would like, although some people find the idea of cheese on a clam cake annoying, or even used as a base for a Eggs Benedict Style breakfast.